Technology has established an amazing symbiosis between the creative process and e-Commerce. These days, when everyone can show oneself as an artist, every creator has a right to become a distributor either. Thanks to high-speed data channels, any piece of information can be instantly shared with millions of people worldwide. This leads to revolutionary outcomes: people now prefer to download such items as books, music, videos, or software, rather than get it on physical media. Why downloadable products have become an integral part of e-Commerce? Well, because they are mutually advantageous for both sides - the merchant and the customer. The shipping question simply lays off, making the merchant’s life much more easier. After a purchase, the product can be delivered straight to the customers’ hands in terms of seconds, depending on their internet connection speed. Also, because of the fact there is no shipping need, your products become reachable from any point of the globe with internet access. 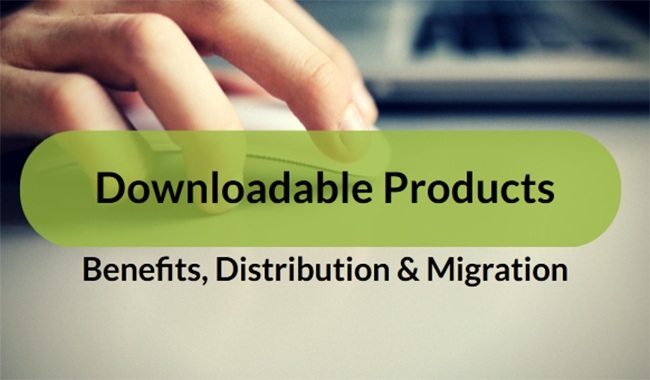 Downloadable products help save what people value the most - time and money. Thus, customers don’t have to wait for two days for CD to cross the country and pay extra for physical media and shipping rates. People prefer digital products because it’s simply convenient: 1000 books in one Amazon Kindle, 1000 songs in one iPod - whenever you want and wherever you go. Let’s assume you’re having some digital products to offer the world. In such a case, there are two ways to reach the customers: via online marketplaces or your own shopping cart. While online marketplaces will most probably guarantee you a lot of visibility, there’s something you have to give up in return. For instance, marketplaces take a significant cut of your sales, deprive you of the right to control the look of the site and, in some cases, set the prices at its sole discretion. If this doesn’t seem to satisfy you, shopping carts will come in handy. They connect you and your customers directly and, what is more important, on your own conditions. Using e-Commerce platform, you’re in complete control of the products pricing and website design, not to mention the fact that you get 100% of the sales revenue. The only drawback in this case is the need to take care of SEO and customer acquisition by yourself. Even retailers of physical goods can take advantage of downloadable products. For example, you could try to enlarge the subscription base by asking customers to leave their contacts in exchange for downloads. Thereby, with the help of an e-book, video tutorial, whitepaper, high-res wallpaper or any other digital product you’ll increase the coverage of your next email marketing campaign. Likewise, you could use the similar tactic in needs of promotion by asking customer to share the product page in social networks. Understanding the value and importance of digital products in e-Commerce, Cart2Cart has broaden its comprehensive possibilities with a new transferable entity. Henceforward, you have an opportunity to migrate downloadable products easy, securely and fully automatically. It means that every digital product you offer alongside with all the other available data will be moved to your brand new store in terms of an hour or more, depending on store’s size. Wonder how everything works? Try out Demo Migration now absolutely for free!